… more than just a terminal. 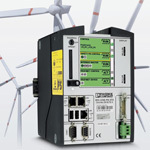 Phoenix Contact is a strong and reliable partner for the wind power industry thanks to an array of high-performance automation solutions, high-quality electronic components, and innovative systems and solutions flanked by global support services in the areas of sales, engineering, service and training. Product innovations and specific solutions for individual customer requests are developed at the locations in Germany, China and the United States. Numerous patents underline the fact that many developments of Phoenix Contact are unique in their own. In close cooperation with universities and science, future technologies like e-mobility and the digitalization are explored and integrated into products, systems and solutions for the market. Phoenix Contact is a veteran of wind energy with over 20 years experience in the field and one of the world's largest suppliers to the wind power industry. Both our electronic components and industry-specific systems and solutions are highly respected. Our understanding of being close to the customer is to be at home no matter where we are in the world and speak the language of the customer. This tenet is our contribution to a cooperative business relationship. It is the third largest construction project in the over 90-year history of the company. The new Phoenix Contact building in Bad Pyrmont was moved into in recent months after taking 18 months to build. Phoenix Contact presents inspiring technology concerning wind power plants and wind parks at the leading wind fair at the Hanover Fair 2013. Phoenix Contact offers monitoring systems which enable you to check all relevant data on your rotor blades online. Be part of the HUSUM WindEnergy and leave with an unforgettable memory of Phoenix Contact. As a manufacturer in industrial automation technology, Phoenix Contact provides tailored solutions for companies in the wind power sector.